The Wirehaired Pointing Griffon is a very energetic dog that loves people. It is very obedient and loyal to its owner but can be very independent if need be. It is a great option for a family pet, as it loves to please people, its very friendly, and they have a great sense of humor. When presented with a stranger, this breed will typically react in a friendly manner and do not get startled easily. If other dogs and pets approach this pup, it still will remain friendly. Keeping these dogs in tip-top shape require exercise on an every-day basis. They are avid runners, and if their owner runs as well, this can be very beneficial to the dog’s fitness. The wirehaired pointing griffon also likes to get exercise from different types of games or swimming in lakes, pools, pond, etc. Anywhere there is water, this breed will take a swim! If this dog has warm shelter, it can live outside if need be. However, it will do best in an atmosphere that allows the dog to spend time outdoors and also indoors. It has a harsh coat, where its name got the term “wire” haired from, and it needs to be combed at least twice a week. Their ear canals also tend to fill with their wiry hair and require plucking occasionally to avoid health concerns and hearing problems. This is a small price to pay for such a fun-loving companion. There are not too many health concerns for this breed. There are no major health concerns that effect the wirehaired pointing griffon more than it would effect any other breed. Minor health concerns include chronic hip dysplasia, otitis externa, and ectropion. If you notice your dog limping or having trouble going up and down the stairs, then you may want your dog to get tested for any types of issues. To ensure your dog stays healthy as long as you have it, it is recommended to get hip, eye, and blood tests done to track your dog’s health. If you keep your dog healthy and active, then it can live up to 14 years old on average! The history of the wirehaired pointer griffin is interesting because unlike most breeds, the creation of this breed was 100% deliberate. In the middle 1800’s, a man named Edward Korthals of Holland set forth to create his ultimate dog breed. He crossed twenty dogs to represent seven different breeds including griffons, spaniels, water spaniels, German pointers, French pointers, and setters. He traveled all throughout France to bring attention to this new breed. He brought the dog along to any shows he frequented or any business meetings he was attending. After France adopted the breed, it then gained a reputation as a wonderfully careful hunter with a phenomenal scent. When this breed came to America, it was originally recorded as a Russian Setter in 1887. It began to gain popularity, especially after World War II. 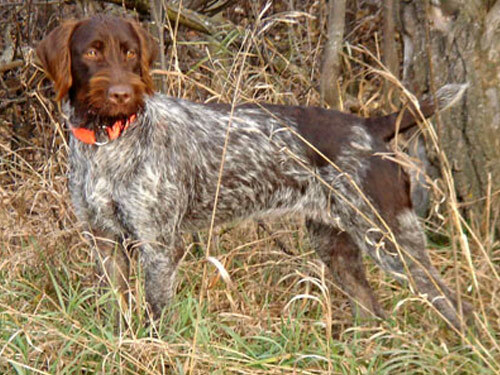 The wirehaired pointer griffon is a great companion to any hunter and is very loyal.